“Can’t put into words how awful this recipe is! My diners referred to it as sediment dredged from the River Thames! Saag Aloo is a British curry house favourite of the world’s two blandest vegetables combined in what can only just be rescued by the miracle of spices. The keyword here is just. I felt a weak moment approaching. So I went straight to the Peruvian man for sympathy. The resident photographer and food taster. This, from a man brought up in the land where potatoes originated. I didn’t make it up. It’s an actual recipe. It’s also one of the most requested recipes on my blog, I persisted, and one of the most common keywords for people to get here. Not content with totally missing the point of this blogging business, he proceeded to refuse to photograph the next effort. Not ready to be outsmarted, I dished up try 3 with a full meal and held the feast back until the photo was taken. If my gruesome intro and ghastly description hasn’t put you off, this recipe is actually quite lovely. The key is to cook the potato with the spices without parboiling and to use lots of salt, some green chilli and a squeeze of lemon juice at the end to lift the spinach. I always ate this back home with pureed spinach. But you could just use chopped, frozen spinach like I did here. And here it is. If this is what you get when you put the world’s two blandest ingredients together, I’ll have a 2nd helping with an extra serving of abuse, thanks. Dice the potatoes into small cubes and mince the garlic. In a medium pot or wok, bring the oil to heat on high. When it starts sizzling around a wooden spoon, gently drop in the garlic and potatoes. Toss them gently and mix in the spice powders. You want to stir this until the potatoes are almost cooked – you will know because the outside will be translucent and a fork will go through a piece with some difficulty. If the potatoes start going brown or sticking to the bottom of the wok, add a tablespoon of water. You could even cover the wok to help cook the potatoes faster. Next mix in the spinach and green chillies. Mix the ingredients together for another five minutes until the potatoes are cooked. Add salt to taste, stir through the fresh coriander and squeeze a little lemon before you serve this. Mallika, I kind of sympathize with the commenter for the taste (but of course not for the words used) I hate Palak Paneer or Saag Aloo. But somehow this is so popular here among Americans that I am asked for the recipe everytime and I confess I do not cook it. Not that I do not know the recipe but for the fact that I don’t like it. I have occasionally made it but you are right it has to have a kick to it or else can’t touch it. But one difference though when the spinach is just a smattering in a load of potatoes it does not feel all that bad. I tried this yesterday. It is a very easy recipe & came out great. I think addition of green chili & lemon juice did the trick. Thanks for the recipe. Aw, thanks so much for the kind words! Love Saag, love Aloo – with anything but Saag. If for whatever reason I am forced to cook them together, I’d use your recipe and add a dash of grated nutmeg and pinch of kasoori methi. Don’t know what the fuss is about, I make this recipe without salt, already had 2 heart attacks, and really enjoy it. I like potatoes and spinach in any combination. There are a couple of Indian Restaurants we found near Chicago that make this recipe and it was very good. Keep up the great work. What? How can anyone not love saag aloo? I don’t care if it’s not traditional, cooked well it’s one of my favourites. Although, cooked badly it is pretty awful. But then again, so are most things. That’s crazy, they might have been terrible cooks and totally butchered your recipe… even a boiled egg can be horrible in the hands of the wrong person. Don’t take it to heart! It sounds like the ideal comfort food ! I’ll be trying this the minute this brief sunny spell ends . I tried aloo-saag once and my hubby absolutely hated it. His feedback was it could have been better if the spinach was not pureed. I have not had the heart to try it again. Now, maybe I will! This is a great recipe! I have never liked saag, so this was an experiment for me. And it turned out great. I however added a little bit of chaat masala in the end and I really like it, its gives a nice tangy flavor. Oh my.. How can someone hate this combination for spinach and potato. I lurrrrrrrve it. But yes, I agree to the fact that it needs loooooots of salt because potatoes absorb too much salt, plus lots of green chilli. Green chilli adds a heaven to anything 😀 I know i m sounding like typical desi taste bud and i m proud of it actually. I simply love this subzi combo with a big dab of butter or butter ghee on it. Hi Ess, nothing wrong with being a typical desi 😉 Thanks so much for adding your support! Don’t take it too personally. Whoever critiqued it was probably an awful cook and botched it. Just wanted to let you know, we love your saag aloo!! Love your web site for that matter!! We love curries so your web site is a firm favourite with us. Tuesday night is date night for us, can’t think of anything better than a Curry with saag aloo (would not be the same without it) and a bottle of wine! Me and my wife also loved this recipe, will be making it in the future for sure. Much love from Sweden! Saag aloo has always been a favorite of mine, they don’t know what they are missing! Don’t take it to heart Mallika, you have no idea what their cooking level is or the quality of their ingredients. And personally, I would never serve a dish at a dinner party if I hadn’t tried to cook it at least once beforehand! Saag aloo is awesome an this recipe speaks for my needs! I have tried saag for a first time in India, when being on my business travel. I love it, but not sure I would be able to prepare it myself very good. It’s not you, it’s people who think they know food but haven’t a clue. India itself is all about the vegetarian, and although I’m not one, I grew up among various cultures and beliefs and have spent time over in India and, to boot, have been cooking Indian food for well over 20 years. A simple dish such as this with some chapati is real Indian food but these idiots only know the fake rubbish they’re served up in Western restaurants. I wonder whether your rude commenter might have the sort of problem with fresh coriander leaves (cilantro) which I and many others do. It is apparently genetic and if you lack the genes to appreciate this ability to taste it properly, it tastes soapy and bug-like. Not that I’ve really eaten bugs, but that is what it brings to mind. My children love cilantro, but I cannot deal with it though I love powdered cumin. Otherwise, I do enjoy saag aloo and will just make your recipe without the cilantro. I love Saag Aloo and this is quite the best recipe I’ve found for it, thanks for posting. p.s. the second time I made it I forgot the lemon and couldn’t work out why it wasn’t as nice as the first time. I only realised once I’d snaffled about half of it, but it made such a difference once I’d added it to what was left! Hi Christopher, I am thrileld to hear that it’s your fav! Hi Kristi, that’s really fascinating. I will look it up. Everyone I know adores coriander leaves. Paul, ha ha, that made me giggle. Idiots, indeed!! 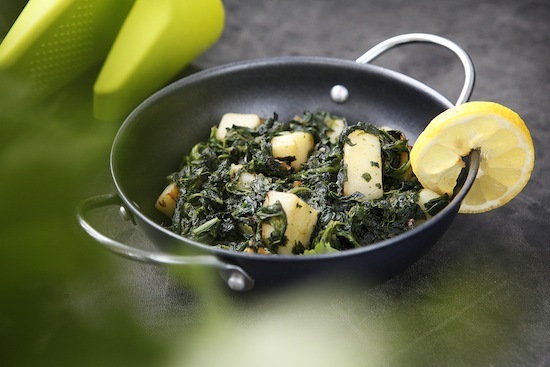 I absolutely love Saag Aloo – I first made it using the Shwartz Saag Aloo mix but they don’t make it any more so I have ‘Googled’ the recipe and there are loads of variations. I tried this using the dried herbs but also fresh spinach, fresh coriander and fresh baby plum tomatoes. I also added a tin of chick peas and it was lovely. A meal in itself but we had it with lamb. Best of the recipes for the dreaded spinach. Popeye would approve. Add a quarter teaspoon of lime powder at the end and a dollop of garum masala. Oh right – it’s your readers’ fault for attempting to cook and eat your recipe? Or maybe it’s the fault of their culinary culture? Thanks for this – it does make a few things about ‘this blogging business’ much clearer. I won’t be trying any of your recipes though. Take responsibility for what you post FFS! I’ve tried all the variations of saag aloo on your site and this one does take the cake. Such a simple recipe, but so good. Perfect for the end of winter when there’s nothing fresh and local that’s green (well, except cabbage). Uses a package of frozen spinach nicely.